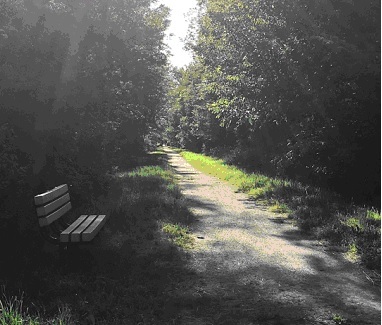 The Kissing Bridge Trailway extends 45km from Guelph to Millbank along an abandoned railway bed. It is named after the covered bridge in nearby West Montrose. It is part of the G2G (Guelph to Goderich) rail trail. 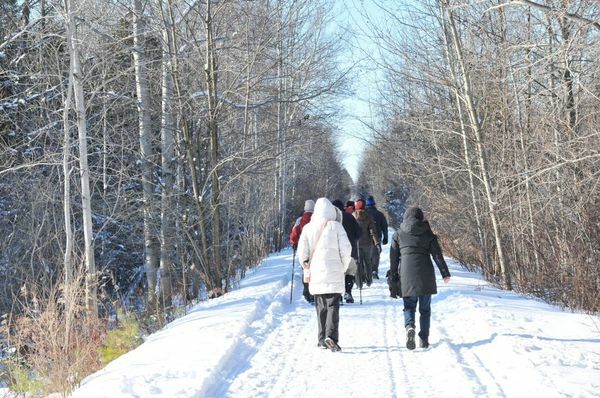 The province of Ontario purchased the abandoned Canadian Pacific railway line and in 1988 the County of Wellington and the Regional Municipality of Waterloo jointly leased part of the line for use as a recreational trail. The Guelph Hiking Trail Club maintains the 12.3km from Silvercreek Pkwy N. trailhead (Wellington Rd 39) in Guelph to Katherine St near West Montrose. The trail is broken at the Grand River and requires road walking to return to it on opposite bank. There is limited parking at trailhead on Silvercreek and on Marden Rd. Parking for the trail in Ariss is at the end of Schuett St. It is mostly flat trail with stone chip base. Permitted uses include hiking, cycling and skiing.